While I always enjoy hiking to a great waterfall, it’s even better when the waterfall is close to the road, but still has the feel of being in a secluded area. Buttermilk Falls (also known as Homewood Falls) in Beaver County is one such waterfall. Buttermilk Falls is a plunge waterfall that features a roughly 20-foot drop into the greenish pool below. A train track runs just above the top of the falls, making this a great waterfall for those who, like me, love both trains and waterfalls. 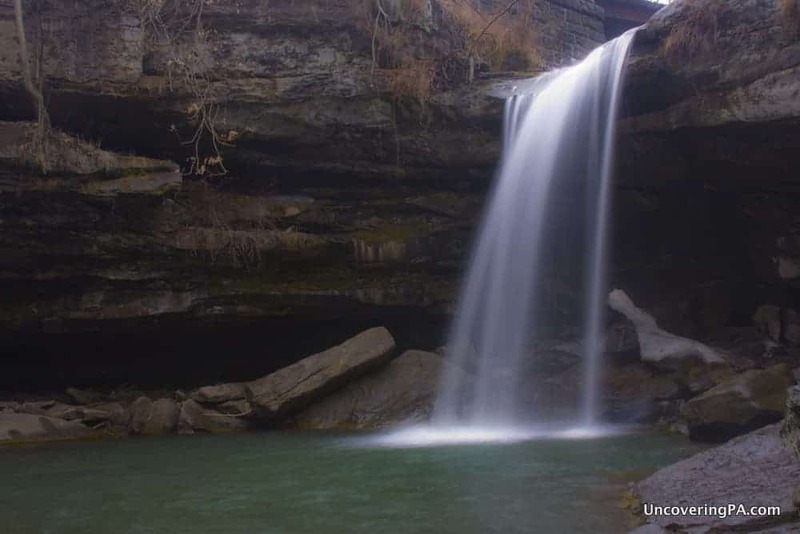 According to the plaque near the top of the waterfall, the falls was given the name Buttermilk Falls by a group of Civil War soldiers and their wives in 1870. Raising their buttermilk-filled glasses to toast after their picnic, they named the waterfall Buttermilk Falls. 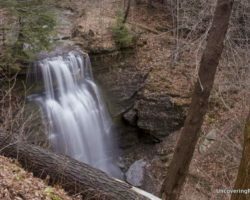 However, since there are so many Buttermilk Falls in Pennsylvania (I know of at least nine), the waterfall is also commonly referred to as Homewood Falls. Buttermilk Falls (Homewood Falls) in Beaver County from above. 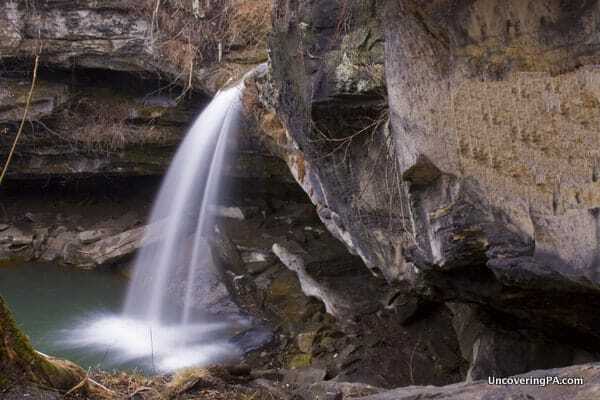 The name Homewood Falls comes from the Homewood sandstone quarry near the waterfall. It was from this area that stones were quarried to be used in nearby tunnels, roadways, and Western Penitentiary in nearby Pittsburgh. The quarry is visible as you make your way to the bottom of the waterfall from the parking area and creates some rather dramatic cliffs along the pathway. Getting to Buttermilk Falls is quite easy. 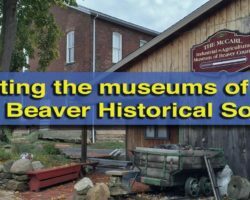 It is located on Route 18, just a few hundred yards off I-76 in Beaver County. While the waterfall is technically in Homewood, Buttermilk Falls is closest to Beaver Falls, Pennsylvania. The bottom of the falls is reached from the lower parking area. This Buttermilk Falls hike will take you an easy five-minutes to arrive at the waterfall. Along the way, you’ll pass through the old quarry on your right and several smaller cascades along Clarkes Run to your left. The coordinates for the lower parking area are 40.813135, -80.325933. While it may be possible to scramble up the steep hillside to the top of the falls, the easiest way is to return to the parking area and drive up the hill to the church. Parking in their parking lot, head to the right of the church down the short trail to the top of the falls. The turnoff for the Buttermilk Falls Natural Area. Overall, I think Buttermilk Falls is a great destination. 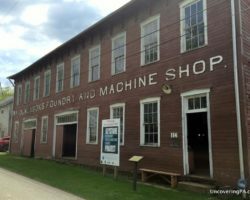 Located less than a mile from the Pennsylvania Turnpike, this is a fantastic waterfall to visit, even if you are just passing through the area. 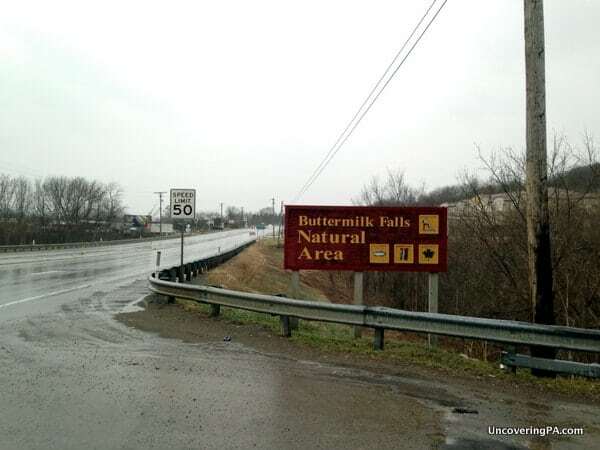 Check out the map below for the exact location of Buttermilk Falls in Beaver County. 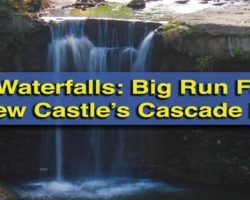 Want to see more waterfalls in western PA? 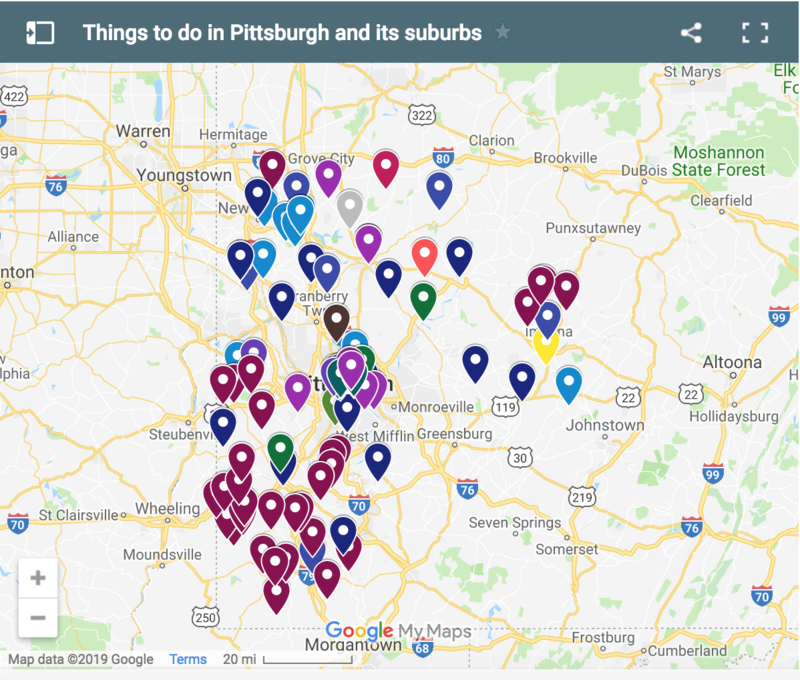 Check out our favorite waterfalls near Pittsburgh, Fall Run Park, and Frankfort Mineral Springs Falls. I’m a photographer and I’m looking for waterfalls that I can take some my female models to for photo-shoots where they can interact with the water and the falls. 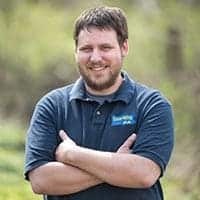 I’m base out of Indiana pa. Do you know any good waterfalls that are with in 2hr drive for me to take these models too? They can be off the batten path. There are a lot of good ones. You can see a lot of them on our waterfalls in PA page. 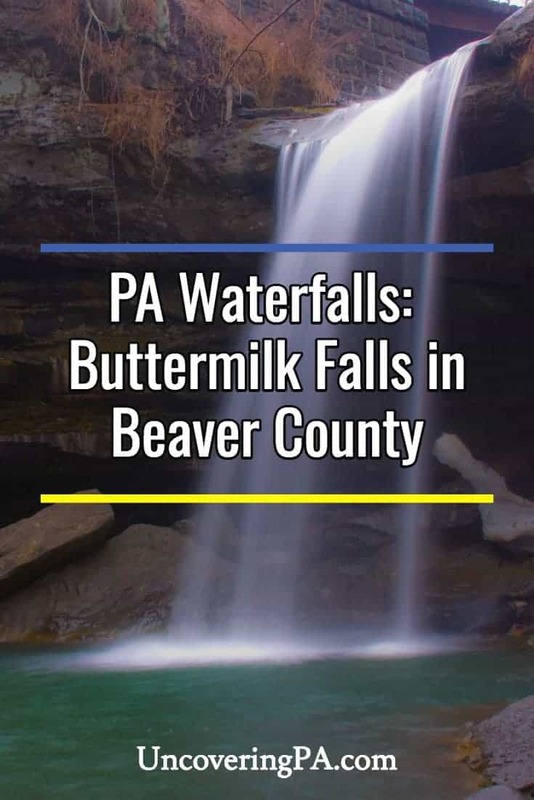 In Indiana County, there’s Buttermilk Falls (a different one than the Buttermilk Falls on this page). Springfield Falls in Leesburg PA. Just off Route 19 a couple hundred yards. That’s a great waterfall. 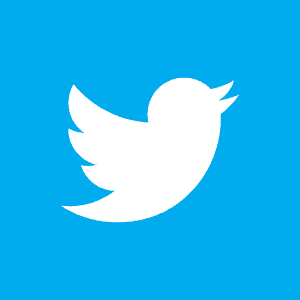 I have a separate post all about it.